The injector circuit has a pulse voltage signal. No fault code or fault code content is irrelevant to the injectorwhen using a diagnostic scanner. After the start-up, remove thecommon rail injector, and there are signs of fuel injection at the front end of the injector. If you check which injector has a large amount of fuelreturn, you can replace the injector one by one to see if the fault phenomenon disappears. The necessary conditions for BOSCH common rail injector to start fuel injection. Unplug the rail pressure sensor and check the rail pressure sensor harness end with a multimeter: 5V between 1-2, 5V between 1-3 is normal, or you can use a pin of multi-meter to connect 2 holes, another pin on the table,if 4.8. v is normal, the third hole, is about 4.8v is normal. High idle speed means that only one speed is 1100 rpm after the engine is started, and the accelerator pedal is invalid. High idle speed is generally caused by a throttle problem. The throttle of the common rail engine is a double potentiometer type. Check the throttle line: the first voltage should be 5V, the second voltage is 5V normal; see the first signal voltage of the diagnostic scanner is about 2 times the second signal voltage which is normal. If the first voltage is not 5V, it is 3.2V (the same voltage as the common rail). At this time, remove the rail pressure sensor, and the voltage of the throttle becomes 5V, indicating that the rail pressure sensor fails and the common rail assembly is replaced. Reason 3: Excluding all peripheral line faults, the problem cannot be solved. Consider the ECU internal program problem, the probability is very small. The starting instant sync signal should fluctuate between 3-48, and finally 48 means signal synchronization. When the idle speed is between -2000 and +2000 is normal; less than -2000 indicates that the pipeline is blocked or leaking, the diesel is not smooth; more than 2000 indicates the injector, backflow pipe leak. P1011 rail pressure closed-loop control mode fault 0–the rail pressure is lower than the target value; this fault may be reported as an instant, then the fault will disappear when the difference between the two is within the allowable range. P1014 rail pressure control deviation fault—mode 7, rail pressure control deviation fault—mode 10. If the engine accelerates up to 1700 rpm, and the fault light is on, the fault code read out is: the rail pressure release valve is open. At this point, you can feel it by hand: you will find that the temperature of the common rail return line is 50 °C higher than the temperature inside the common rail. At this time, the rail pressure in the common rail is a constant value of 720,000hpa! Remedy: After turning off the key switch, turn off the whole vehicle for 20 seconds or even a few minutes, then turn on the power of the whole vehicle, turn on the key switch to start, the rail pressure release valve should be reset, and the starting is normal. There are two possibilities for the opening of the rail pressure relief valve: the fuel metering valve on the high pressure pump is open and the return line is blocked. If these two conditions exist, the bleed valve cannot be reset. When it is not possible to start, try to open the fuel metering valve one or two times. When the fuel metering valve is opened, the high pressure pump is equivalent to the mechanical pump. At this time, the rail pressure relief valve is opened. If the valve is opened more times. If it is too much, it will not be automatically reset. It is equivalent to the failure of the rail pressure relief valve. It is necessary to change the common rail. Therefore, generally do not pull the fuel metering valve. How to manually clear the fault code? When there is a fault in the engine, this method is generally not used. Once the fault code is cleared, the electronic control maintenance personnel can not find the cause of the fault when reading the fault code with the diagnostic instrument, it is difficult to take corresponding measures to repair,When the engine is all normal, you need to try this method when you need to clear the historical fault. Sometimes it can’t be cleared. It is best to operate it through the diagnostic device. Turn off the key switch for about 30 seconds → turn on the diagnostic request switch on the meter → immediately turn the key switch to the ON position → for 4 to 8 seconds → turn off the diagnostic request switch on the diagnostic request switch on the meter. This step is similar to the torque of the traditional Euro 2 system torque point, and achieves the purpose of discharge. If the amount of fuel is too small, the engine is weak, the speed is slow, the power is insufficient, the smoke is too large, and the emission standard is not reached. The AH, DNH, VFK, and DFK gaskets can be adjusted to obtain a satisfactory acceleration curve. within the perimeter,if the consistency is not good, the speed is unstable, and it is easy to flame out and the noise is loud. Larger idling fuel quantity causes excessive speed and smoking, if small idling fuel quantity ,engine is easy to flame out, not easy to start the engine or slow down! Pre- injection is a small amount of fuel injected into the engine before injection. Heat, reduce noise, better for cold start, reduce emissions, pre-injection bigger will increase noise knocking, engine blue smoke, too small will cause start difficulty, there is acceleration noise when engine acceleration , acceleration is not smooth, more violate for acceleration. 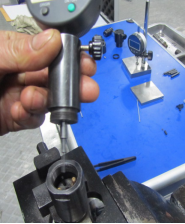 En el banco de pruebas Common Rail, la prueba del inyector pasa por 4 o 5 pasos: prueba de fugas, VL, LL, VE, EM, preinyección, algunos clientes preguntan qué significa este paso, hoy hablamos sobre el significado de estos pasos. , y como afecta el rendimiento del motor. Este paso simula la inyección de combustible a plena carga del motor, y el sensor de flujo del sistema detecta con precisión la cantidad de inyección de combustible y la cantidad de retorno. La tasa de flujo mostrada es el único valor de inyección del inyector. El efecto de la cantidad de inyección de combustible es el mismo que el del sistema Euro 2. La junta DNH en el inyector se ajusta para ahorrar combustible. ¡La cantidad de retorno de combustible se detecta aún más si el conjunto de válvulas de control del inyector de riel común está dañado! Este paso es similar al torque del tradicional punto de torque del sistema Euro 2, y logra el propósito de la descarga. Si la cantidad de combustible es demasiado pequeña, el motor es débil, la velocidad es lenta, la potencia es insuficiente, el humo es demasiado grande y no se alcanza el estándar de emisión. Las juntas AH, DNH, VFK y DFK se pueden ajustar para obtener una curva de aceleración satisfactoria. LL: ¡Suministro de combustible inactivo! La inyección previa es una pequeña cantidad de combustible inyectado en el motor antes de la inyección. El calor, reducir el ruido, mejor para el arranque en frío, reducir las emisiones, pre-inyección más grande aumentará el ruido, el humo azul del motor, demasiado pequeño causará dificultades de arranque, hay un ruido de aceleración cuando la aceleración del motor, la aceleración no es suave, más se viola la aceleración . 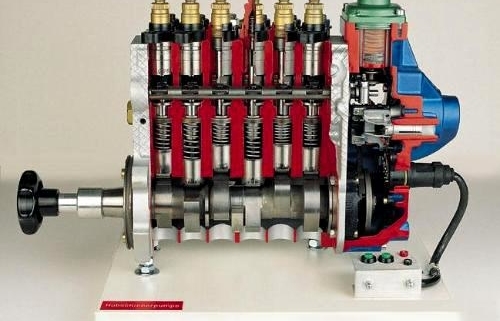 How To Test A Diesel Injection Pump ? The high pressure pump is fixed to the table rail by special clamping devices. 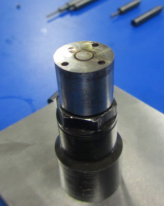 The front end of the high pressure pump is connected to the test bench universal joint via a coupling. 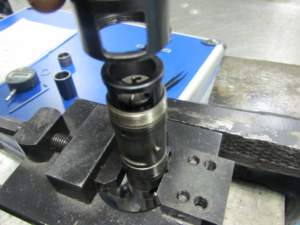 When installing, it must be ensured that the high-pressure pump camshaft is coaxial with the test-table drive shaft, which can be achieved by installing a special pad between the high-pressure pump and the guide rail. 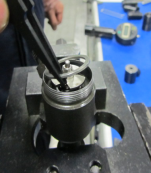 After initial fixing, turn the universal joint dial 1 to 2 turns. When it feels smooth, tighten the large bolt and nut. After installation, the high-pressure pump should run smoothly and reliably, be firm and reliable, and have no jitter and looseness. The pump test bench is connected to the three-phase power supply, and the speed control handle is turned to make it in the zero position. When the motor start button (green) is pressed, the motor can be started. When stopping, turn the speed control handle to reduce the dial speed to zero first, then press the stop button (red) to avoid stopping at high speed. The test bench will be damaged and an accident will occur at the next start-up. According to the required speed and direction, select the gear position of the gearbox, and turn the speed control handle to change the speed. The greater the deflection angle of the speed control handle, the higher the speed. The pressure of the fuel system is regulated by a pressure regulator. 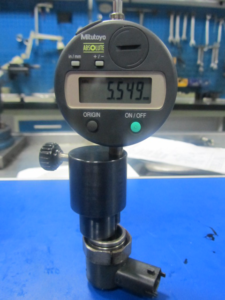 When the handwheel is rotated clockwise, the pressure can be adjusted within the range of 0 to 0.6 MPa, and the pressure can be adjusted within the range of 0 to 6 MPa when rotated counterclockwise. The pressure diesel fuel is sent from the fuel supply joint of the pump test bench to the high pressure pump under test through the fuel pipe. When the fuel temperature is lower than 40 °C, turn the heating valve handle clockwise to increase the fuel temperature. When the fuel temperature reaches 40 °C, immediately close the heating valve to stop heating. 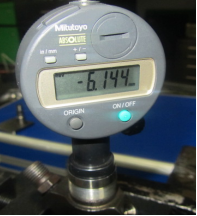 (1) In order to ensure the test accuracy of the pump test bench, the opening pressure of the standard injector should be checked frequently, which should be 17. 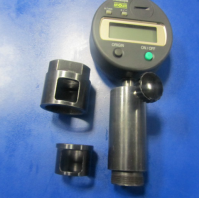 5 MPa; the uniformity of the standard injector should be checked regularly. If there is a difference, the opening pressure can be adjusted. Correction, if not correct, replace the standard injector. (2) The test fuel must pass through the light diesel fuel which has been precipitated for more than 48 hours. It is necessary to replace the new fuel after commissioning 500 injection pumps or 400 hours of operation of the test bench. When changing diesel fuel, use kerosene to clean the fuel tank and filter. 30# or 46# turbine fuel is required for the transmission case and the hydraulic continuously variable transmission. Inject 40# mechanical oil or 150# mechanical oil into the gearbox. The oil level should not be lower than the oil-filled elbow, and it should be replaced every 400 h or half a year. The bearings in the tachometer seat should be lubricated with mechanical oil or turbine oil. When refueling, remove the mechanical watch and inject lubricant from the tachometer seat. (3) Before starting of the pump test bench, it is best to use the lever to rotate the dial until the motor and fuel supply pump rotate at the same time, and then start the operation. Diesel engine performance depends to a large extent on the precise calibration of the fuel injection pump. Although the fuel injection pump test bench has strict technical requirements to ensure the accuracy of the fuel pump parameter adjustment, if the use and maintenance are not in place, the quality of the fuel injection pump cannot be guaranteed. 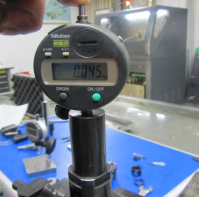 (1) The scale error of the test bench should not exceed ±10 ‘ at any position, and the scale should be clear. 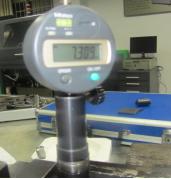 (2) The instantaneous speed fluctuation within each revolution of the output shaft of the pump test bench shall not exceed 1% of the test speed when the output shaft drive disk is measured at >600 r/min; the instantaneous speed fluctuation shall be when the speed is ≤600 r/min. Not more than 6 r/min. (3) The counting mechanism of the pump test bench should be accurate and sensitive, and meet the counts of 100 to 1000 times. The allowable counting error of the whole system is 1 time. 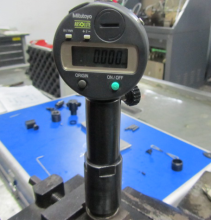 (4) The measuring cylinder of the pump test bench must be clear and accurate. The minimum scale is not more than 1% of the full scale, and the scale error should be within 0.5% of the full scale. (5) The fuel supply pressure of the pump test bench should be adjustable and stable. At the rated speed, the maximum pressure should be reached when the outlets are all closed: low pressure fuel passage ≥ 0. 4 MPa; high pressure oil passage ≥ 34 MPa. 800 mm × 6 mm × 2 mm for the commissioning of the distributor fuel injection pump. (7) The standard injector selected for the diesel pump test bench can be used for fuel supply per cycle not exceeding 300 mm3. When the fuel injection pump speed is 1000 r/min, the fuel supply rod is fixed at the position of 103 mm3 cycle, 1000 pumping fuel quantity When the oil amount is in the range of 102 to 103 cm3, the needle valve opening pressure is 17.5 MPa. (8) For the fuel injection pump in use, due to the limitation of the quality , the fuel injection pump test should be carried out using the original fuel injector equipped on the engine. After the test, the pump installation should be aligned to the engine according to the order of the cylinders on the pump test bench. in order to ensure that the engine works under normal uniform fuel supply from the beginning, until the nozzle coupler is replaced. If the pump is tested with a standard injector and the engine is operated with a non-standard injector, it will not work under the required uniformity of fuel supply, thus losing the meaning of fuel injection pump calibration. (9) The temperature of the diesel pump repair workshop has a great influence on the fuel supply of the fuel injection pump, because the degree of diesel fuel varies with temperature. The standard fuel supply quantity specified in the technical documents refers to the standard room temperature at 20 ° C the amount of fuel supplied. A test proves that when the temperature is lowered from 40 °C to 6 °C, the fuel supply can be increased by 20% to 40%, and the temperature is lowered again, The resistance of the diesel fuel is greatly increased, and the resistance through the high pressure fuel pipe and the injector is sharply increased. The fuel supply has decreased. In order to make the fuel supply test accurate, the temperature of the diesel repair workshop should be kept within the normal temperature range of 15-20 °C, especially the high-speed fuel injection pump is more sensitive to changes in fuel temperature. Remove solenoid valve, remove solenoid valve springs, shims, remaining air gap shims, put a small bush with openings into, screw the pressure cap with opening and screw it down according to <stand torque>, fit on adaptor and amesdial, make sure amesdial slide well and shows zero, gently press the top of the meter axis with fingers, repeatedly press a few times to ensure accurate accuracy, what it display now is: Armature lift. Remove the small circlip, remove the armature plate, spring, using special tool to dismantle valve assembly pressure cap, remove the armature assembly, ball valve and ball valve base, fit on the armature assembly and lift shims, screw down valve assembly pressure cap according to <stand torque>, fit on the armature plate, spring and circlip in order. 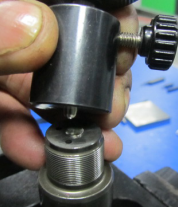 Fit on a thick shim, and put the bush with opening into, screw the pressure cap with opening and screw it down according to <stand torque>, fit on adaptor and amesdial, make sure amesdial slide well and show zero, gently press the top of the meter axis with fingers, repeatedly press a few times to ensure accurate accuracy, what it display now is: The armature total range. 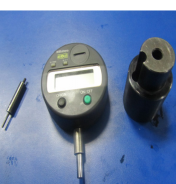 Remove the solenoid valve of CRI diesel injector, put into remaining air gap shim, choose proper gauge stand adaptor and measuring pin, make amesdial show zero on flat surface. 3.1 Now test the distance between armature plate and remaining air gap, to test again after changing the angle to make sure accuracy, and make a record for the data. 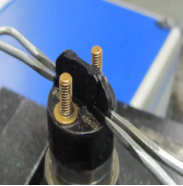 3.2 Test the distance between remaining air gap and electromagnet, to make adaptor surface close together with solenoid valve end face when testing. Use the data to subtract the data tested by first step is remaining air gap. 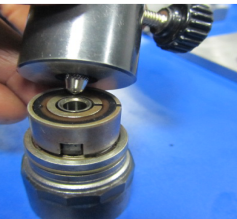 Dismantle solenoid valve of denso injectors, choose adaptor, flat headmeasuring pin and amesdial, and make the amesdial show zero on flat surface, put the armature liftshim on the injector, make amesdial back and forth rotation to ensure the stability test, make a record for the data. 2.Choose standard adaptor and make it show zero on flat surface, make the gauge stand adaptor surface close togetherinthe end face of the solenoid valves on the solenoid valve, put meausring pin in from gap of solenoid valve side to the bottom and to test several points to make sure testing accuracy, and make a record for the data. Use this data subtract the data in step 1 is armature lift. 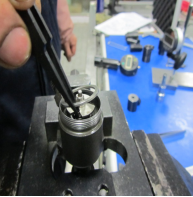 Common rail injector test steps and the impact to the diesel engine’s performance. 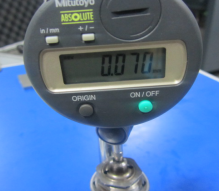 LEAK TEST: This test verifies that leakage of valve assembly, high pressure sealing ring, nozzle pin valve pressure cap part. VL: Max injection amount: too large injection will bring smoke and large fuel consumption; too small injection amount will make the vehicle powerless and slow to speedup. The tolerance each common rail diesel injector should be controlled within 6mm3/HH when adjusting, which is mainly adjusted through nozzle prcision shims. TL/EM: medium speed / emission point fuel injection amount, fuel injection characteristics verification point, excessive injection will bring smoke and emission exceed the standard; too small injection will make the vehicle powerless and slow to speedup. This is decided by nozzle spring shims, armature stroke, cross stroke adjusting shims and solenoid valve spring force shims. LL idle fuel amount: excessive idle will bring smoke, too small will lost throttle and flameout, start-up difficulties, fuel amount unevenness will lead rotation speed do not stabilize, noise, and the engine swings during speedup. Unevenness should be controlled within 2mm3/HH, which is mainly adjusted by nozzle spring force shims. VE pre-injection fuel amount: too large the fuel will knock cylinder and bring smoke, too small will make large noise of the engin, start-up difficulties and powerless to speedup. Unevenness should be controlled within 0.5mm3/HH, which is mainly adjusted by solenoid valve spring force shims. Remarks: The premise of the above adjustment method is various range adjusted within its scope. Pull down solenoid valve, remove the ball and seat, put armature parts and adjusting shim, put the small bush with opening, and screw the small bush on, fit gauge stand adaptor. 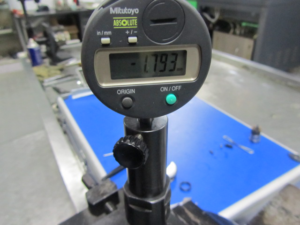 amesdial and pins, fix the amesdial and ensure good amesdial sliding and amesdial shows “zero”, gently press the top of the meter axis with fingers, what it displays now is: armature total range. Load the ball and seat properly into the small bush with an opening, screw the small bush with an opening on, and then screw on gauge stand adaptor, fit on amesdial and probe, fix the amesdial and ensure good amesdial sliding and amesdial shows “zero”, gently press the amesdial top with fingers, what it displays now is: armature lift. 3.2 Remove armature, put the air gap shim into do testing, what it displays now is: air gap lift. Test armature stroke, which decides the hexagonal shim thickness below. Test remaining air gap, which decides the hexagonal shim thickness above. If VE of the common rail injector is not proper, pls debug solenoid valve of spring force adjusting shim. If LL of the common rail injector is not proper, pls debug nozzle pin valve spring force shim. Remove solenoid valve Insulation barrier using special tool, remove the plug and remove the steel ball, remove the solenoid valve, take electromagnet spring and shim out, and then fit on solenoid valve, firstly use the probe downward pressure to check if there is a gap or not, as no clearance pls check ball valve assembly is correct or not, choose to use correct test joints & tighten the solenoid valve according to 《standard torque》, fit on gauge standard adaptor and the longest probe, push amesdial pin to ensure slide freely. Repeatedly press amesdial axis lightly after you make the amesdial shows zero, the reading now is: armature lift. Step 1: Remove the solenoid valve, remove the valve ball and seat, return spring. Fit on armature and cross lift shim, fit on amesdial & adaptor using spherical gaugehead, place on injector and recognize normalized “zero. 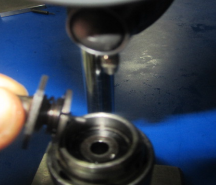 Step 2: Remove gauge, armature assembly and cross lift shim, fit on valve ball, ball seat, armature assembly and cross lift shims to test and confirm the reading, that is: cross stroke data. The excircle of electromagnet end face is armature clamping surface, and the excircle is higher than the inner ring surface, this height difference is the remaining air gap of the common rail diesel fuel injector, choose proper adaptor, fitted spheric gaugehead, and adjust it to show “zero” on flat surface, make it close together solenoid valve end surface, the testing data of gaugehead aiming at the inner ring surface to test is “Remaining air gap”. 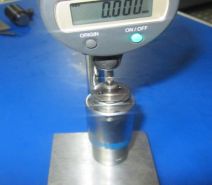 Choose gauge stand adaptor and pin, make it show zero on flat surface, test nozzle pin valve sinking size, load spring, shims, ejector rob and maximum injection adjusting shim, use amesdial to test distance between this height and injector end face, plus nozzle pin valve sinking size, that is pin valve lift, and the size of pin valve lift is the amount of max injection, without influence to other fuel capacity. What is seventh common rail injector? Since 2017, Main big cities in China such as Beijing, Zhengzhou, Shenzhen, Shandong, Hangzhou and other places have successively issued notices of the stopping Euro 3 vehicles , many car owners have gradually realized that the days of eliminate the Euro 3 vehicle are getting closer. Shenzhen announced that since November 1st, Shenzhen began to implement the Euro 6 emission standards for light-duty vehicles and light-duty diesel vehicles. The news that the stricter Euro 6 emission regulations will be reached is being rumored, and major manufacturers are also actively responding, and successively launched their own Euro-6 engine products, and its products in China have appeared as the “seventh injector” components, then what is the seventh injector? First of all, let us first look at the Volvo D13K Euro 6 engine is actually with the seventh common rail injector, many people may find this injector is at the post-processing end, named as the seventh injector is a bit far-fetched, but this The naming rules are still very common in foreign countries. For example, the “fifth round” that we often hear in the materials actually refers to the traction saddle of the vehicle. The “seventh injector” mainly appears on the engine after the DPF is used to process the fuel-assisted combustion regeneration technology. As the name suggests, the engine system has an additional common rail injector. Of course, it is not uncommon to have an extra injector on the engine. Some gasoline engines in the early years were equipped with a cold start auxiliary injector on the intake pipe, while the “seventh injector” of the diesel engine was It is installed on the exhaust side of the engine to meet the PDF regeneration function. Because of the emissions from the Euro-6, post-processing generally uses a particle trap (DPF), which means that DPF regeneration will be involved. During the working process of DPF, as the trapping particles gradually increase and block the muffler, the exhaust back pressure of the vehicle increases accordingly, and the accumulation of particles to a certain extent will affect the power and economy of the engine. The process of the vehicle DPF autonomously removing particles is called the regeneration process. Of course, there are many ways to regenerate, and the active regeneration of the DPF (mainly fuel-assisted combustion regeneration) requires the participation of the “seventh injector”. Because the fuel-assisted combustion regeneration technology is not limited by the quality of the fuel, the burner uses the same fuel as the diesel engine, and the components are mature. There is no need to make major changes to the original structure of the engine when loading the vehicle. All of them will choose such a technical route. For example, the Euro 6 Volvo engine, the domestic Weichai and the heavy duty HSC products all use fuel injection combustion regeneration technology. 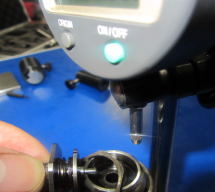 Of course, many manufacturers do not install the “seventh injector”. For example, Futian Cummins’s National Sixth Engine gave up the EGR system, and its DPF regeneration technology does not have the aforementioned seventh injector. Its DPF post-treatment does not use fuel injection combustion regeneration technology. The Cummins engine’s after-treatment uses a U-shaped structural arrangement, which is DOC, DPF, ammonia decomposition and mixing, SCR and ammonia escape monitoring from the exhaust end of the engine, compared with the models of the ordinary four-nation five SCR technology route, except for the structure. More complicated, the most obvious change above is the super-multiple sensors, in which there are five temperature sensors, two NOx sensors added to the two, and a differential pressure sensor consisting of front and rear pressure sensors that detect DPF status. Of course, upgrading the Euro-6 is not only for the choice of EGR, but also for the DPF and SCR who should be on the upstream side of the differences, the performance of different manufacturers is also different. When the DPF is upstream of the SCR, the advantage is that the regeneration of the DPF is easy to achieve and the fuel consumption is low; and when the SCR is upstream of the DPF, the main advantage is that the ignition-off characteristics of the SCR are good. In fact, upgrading from the Euro-5 to the euro-6 is not as simple as the imagination. From the Euro-5 to the 6, it is necessary to overcome the triple challenge of sensors, fault codes and control parameters. The control parameters have increased from 10,000 to more than 15,000. On the basis of the Euro 6 onboard diagnostic system, Guoliu also refers to the permanent fault code anti-cheat requirement proposed by the US OBD regulations, and applies the requirements of the remote emission management vehicle terminal (remote OBD) to the national standard for the first time, which also means The national six emissions will face more complete and strict national monitoring. https://dieseltester-cn.com/wp-content/uploads/2018/12/injector-tester.jpg 607 1080 dieseltester https://dieseltester-cn.com/wp-content/uploads/2018/07/logo-1.png dieseltester2018-12-11 06:36:522019-03-19 05:09:19What Is A Seventh Common Rail Injector? There are dozes of common rail tester manufacturers on Chinese market. Each of them promotes the quality of their common rail tester. The price of the common rail tester ranges from tens of thousands to hundreds of thousands. 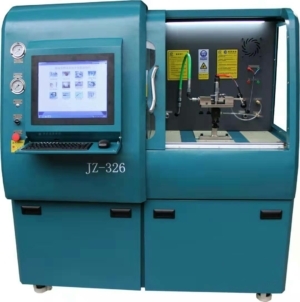 Today, I will briefly explain here how to choose a suitable common rail test bench,below are some important facts for your reference, hope it will be helpful for you. 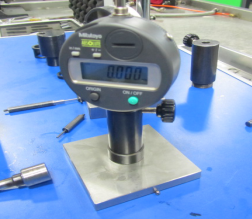 1.The weight of the common rail tester, the weight of determines its own balance and shake. Usually, the test bench with relatively low price can be obviously felt that it is shaking during the test, and the balance of the common rail tester bench is not good. 2.The power of the common rail tester, some customers need 7.5KW, some customers want 18.5KW, the standard power produced by the test bench manufacturers in China is 11KW and 15KW, the power is different, the components equipped on the test bench is different, such as universal joints ,coupling, frisbee, and the weight of these parts determines the smoothness and inertia of the speed. 3.The quality of the main parts which are on the common rail tester: fuel pump, rail, DRV, pressure sensor, control valves, must ensure that are geniune and new, such as bosch DENSO DELPHI pumps and rails are good choice, regarding these parts, i would like to say a little more, after all, it is too important for a common rail tester’s performance. The common rail is the pressure accumulator, and the fuel pump is the source of power. 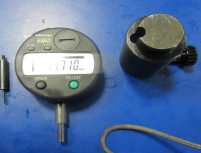 The stability of pressure and fuel temperature will directly affect the repeatability and stability of the test data. That is to say, the performance of the rail and the common rail pump will directly affect the accuracy of the data. But in order to confuse customers, some manufacturers will work hard on the software to keep the pressure data displayed on the test bench in a stable state, to cheat customers. 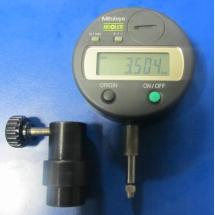 At this time, you can take a mechanical pressure gauge to test whether the actual pressure and the displayed pressure on the test bench are consistent. 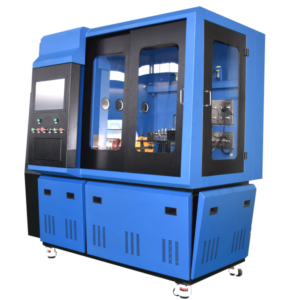 Or you can take a single test on the test bench with a fuel injector, single-step test and continuous test to check the repeatability and stability of the data. Regarding the fuel pump, the pump of CP3 is generally equipped on the common rail test bench, and the pump of the CP1 is equipped on the fuel injector tester, but the new original pump on the test bench which are bought by foreign customers , because for foreign customers, it is not easy to do the after-sales service, in order to avoid future problems, usually use new genuine fuel pump, for China domestic customers, they prefer the cheap common rail test bench, and easy for after-sales service, so it is usually equipped with second-hand pump, that is, removed from the engine, but the performance is still intact. In addition to these important components, the quality of other hardware on the common rail tester needs to be noted. For example, inverters, the good brand is such as LG or Siemens. Lower level is that made in Taiwan or China mainland, the cost is a little cheaper, like therail combination I talked about above, it can meet the test basic needs, but who know after 5-10 years? 4.The flow sensor is the main core component of the common rail tester. The pulse is hundreds to more than ten thousands. 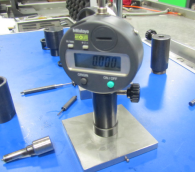 The larger the pulse, the more accurate the precision and the quality, the price will vary greatly (without the sensor, the test bench is a scrap iron, one customer said). that the accuracy of the sensor directly determines the accuracy of the tested fuel. 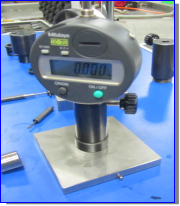 Some common rail test bench manufacturers use high-precision gear flow meters produced in Germany. Some manufacturers use Australian flow sensors. Some manufacturers use OEM China flow sensor. The flow sensor is produced in China, but the it shows the original name. In general, the German flow meter is the most expensive and the best quality. 6.The selection of electronic original devices also affects the service life of the common rail test bench. 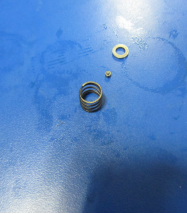 These small components can only be seen by the customer to see its quality. 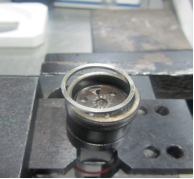 If the quality of the electronic components are not good, the test bench will have some minor problems, although they are not big, but they will make you feel bad. 7.The software control system of the common rail test bench. After more than 10 years of development, there are only 2-3 software producer in China to supply circuit board to all these test bench manufacturers, that is, it is possible that many test bench manufacturers use the same software system, just These programmers have designed different appearances for different test bnech manufacturers, avoiding the embarrassment that customers have identified as “plagiarism.” These programs are slightly different, each with its own advantages, customers can choose the style they like. If there is a problem with the test bed software, the after-sales solution is usually to replace the board directly. 8.Finally, user-friendly design and a better user experience of the common rail tester are also important. 9. Hoping my above ideas can be helpful for you to choose the common rail test bench that you are satisfied with. 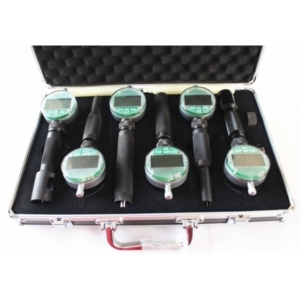 https://dieseltester-cn.com/wp-content/uploads/2018/06/eps_205_w734.png 353 734 dieseltester https://dieseltester-cn.com/wp-content/uploads/2018/07/logo-1.png dieseltester2018-12-06 03:05:022019-03-19 05:10:12How To Choose A Common Rail Tester? The fuel injection pump is mainly composed of a pumping mechanism, a fuel supply amount adjustment mechanism, a drive mechanism, and a fuel injection pump body. Wherein, the pumping mechanism comprises a plunger coupler, an oil outlet valve coupler, etc. ; the oil supply amount adjusting mechanism refers to a rack type oil quantity adjusting mechanism or a fork type oil quantity adjusting mechanism; the driving mechanism comprises a cam shaft, a tappet assembly, etc. The fuel injection pump body is the mounting base of the above three, which requires sufficient strength, rigidity and sealing, and is easy to disassemble, adjust and repair. Suction process: the plunger is driven by the cam of the camshaft. When the convex part of the cam leaves the plunger, the plunger moves down under the action of the plunger spring, the volume of the oil chamber increases, and the pressure decreases; when the plunger is sleeved When the radial oil inlet hole is exposed, the fuel in the low pressure oil chamber flows into the pump chamber along the oil inlet hole. 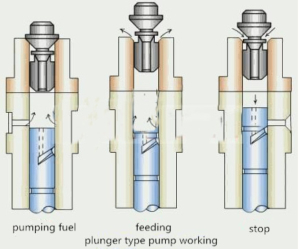 Pumping process: When the convex part of the cam pushes up the plunger, the volume in the pump chamber decreases, the pressure increases, and the fuel flows back to the low pressure oil chamber along the radial oil hole on the plunger sleeve; When the upward flow to the radial oil hole on the plunger sleeve is completely blocked, the pressure on the pump chamber increases rapidly; when the pressure overcomes the preload force of the fuel valve spring, the oil discharge valve moves up; when the oil discharge valve is on When the pressure relief belt leaves the valve seat, the high pressure diesel fuel is pumped into the high pressure oil pipe and injected into the cylinder through the injector. 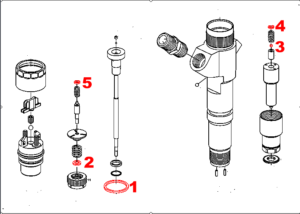 Fuel return process: As the plunger continues to move upward, when the chute on the plunger communicates with the radial oil hole on the plunger sleeve, the fuel in the pump chamber passes through the axial oil passage on the plunger, obliquely The oil hole on the oil passage and the plunger sleeve flows back to the low pressure oil chamber, and the pumping stops.